At Mobile Truck Rental, we make the truck rental process a great deal more enjoyable. To start with, our customers are not required to visit our nearest rental location in order to collect their hire vehicle. And secondly, our customers do not need to return the vehicle to us when they’ve finished with it. At Mobile Truck Rental, we take the hassle out of Brisbane truck rental. Asking customers to collect their own vehicle inconveniences them, so we take the liberty of delivering their rental truck directly to their front doorstep, at a time that best suits them. Likewise, when it comes time for customers to return their vehicle to us, we arrive at their location and collect the vehicle from the nominated address, anywhere in Australia. We offer a rapid approval process that ensures customers are able to take delivery of their rental truck in record time. For a fabulous deal on truck rental throughout Brisbane, contact the team at Mobile Truck Rental now on 1300 799 317. Whether you need a rental truck for personal jobs or commercial purposes, our Pantech trucks are ultra-reliable pieces of machinery that enable you to concentrate on the task at hand. If you require the services of an unbreakable, all-purpose transport vehicle that can cope with anything you ask of it, our fleet of hire trucks will not disappoint you. The most popular use for our hire trucks is DIY removal. If you require the services of heavy duty removal truck to transfer your personal items, haul big and burdensome industrial equipment or furniture, or if you need to relocate the entire contents of your small business, our 3 tonne trucks are the perfect answer. Be sure to read our handy guide on safely loading and unloading heavy equipment. Whatever your need for renting a truck is, the team at Mobile Truck Rental will help guarantee the entire rental process runs smoothly for you. 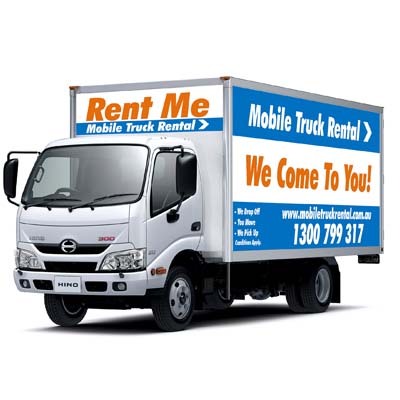 At Mobile Truck Rental, we make Brisbane truck rental affordable. Our vehicles are all immaculately clean, maintained and serviced on a frequent basis and come fully equipped with all the gadgets you need to perform your transport duties in total comfort. Competitive rates with no hidden charges. First Class Customer Service – our call centre staff have a degree of industry knowledge and can provide all the assistance you need to ensure that you receive the best possible deal and the best vehicle for your needs. Our call team will arrange to have a 3 tonne Pantech truck sent out to your location at a time and place that is most convenient for you. They’ll arrange a custom rental contract that matches your situation precisely. We have a long history of providing premium quality hire services to our clientele. Please take the time to browse our testimonials section and read what they have to say about their experiences with Mobile Truck Rental. Our quick and easy online quote form allows you to request a quote from us in a matter of moments, to which our consultants will swiftly respond to. If you have any questions at all regarding our removal truck hire services, please don’t hesitate to call us now on 1300 799 317. Clean, Reliable and Well Maintained Vehicles – when you rent a truck, reliability is everything. Our fleet of late model Pantech rental trucks are hardy work vehicles that will help guarantee that all your jobs finished on time and with minimal fuss. All trucks are serviced by trade-certified mechanics on a consistent basis to provide optimal drivability. All of our vehicles undergo stringent performance testing and no truck is ever made available for hire until it has passed all of our quality assurance tests. Premium Quality Hire Trucks at Affordable Prices – take a peek at our truck rental rates and you’ll quickly discover how much you stand to save by hiring a Pantech truck. At Mobile Truck Rental, you have the power to choose the size of vehicle you need to get the job done quickly and can hire a vehicle for as long as you desire. There is complete transparency in our service pricing and you will never be slugged with hidden charges. Ideal for Domestic or Commercial Use – each rental truck offers extensive storage room, with our 3 tonne truck able to comfortably transfer the entire contents of a 3 bedroom unit in a single haul. Although larger than ordinary passenger vehicles, our Pantech trucks are just as easy to drive, enabling occupants to travel smoothly to their destination in air-conditioned comfort. Be sure to read our driving tips guide on how to safely operate your new vehicle. Moving house or relocating your business can be an arduous affair, but our vehicles are purpose built to excel at these exact tasks. Avoid paying outrageous sums of money to have a removalist do the work for you. Do the smart thing and hire a rental truck. You’ll be saving yourself a small fortune by doing so and our super convenient service ensures that you don’t have to waste time and money driving to the rental site to collect your vehicle or driving to another one when you reach your final destination. We do the collecting for you. We drop your hire truck off at your specified address and we collect it from you once you’ve finished using it. It’s that simple. For a free quote concerning removal truck hire throughout Brisbane, contact the team at Mobile Truck Rental now!